A controversial Bronx landlord sold a Bronx rental building at 888 Grand Concourse for $28 million after years of fighting over living conditions with tenants. Jonathan Bombart sold his six-story, 91-unit building last week to an affiliate of Bronx landowner Chaim Hirschfeld, according to property records filed with the city Monday. Hirschfeld also purchased three apartment buildings at 3203-3207 Oxford Avenue in the Bronx in January. 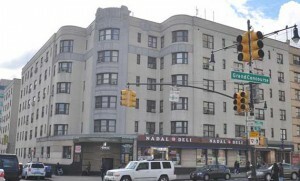 Lenders on the property had started foreclosure proceedings on the building due to unpaid debt, but Bombart was able to retain control of it in February after bringing in Castellan Real Estate Partners, a major multifamily investor in the city, the Bronx Times reported. Tenants of the building had fought with the Bombarts for years over poor conditions in their homes, going to Housing Court and holding a rent strike in February 2016. Bombart and Hirschfeld could not be reached for comment.